'He Died Alone': A Grieving Father Searches For His Teenage Son In Mosul : Parallels Bashar Abdul Jabar's son was trapped when his legs were crushed during Iraq's military campaign to retake Mosul from ISIS. The family had to leave him behind. "We have no comfort," says Abdul Jabar. Bashar Abdul Jabar lost his 15-year-old son, Ahmed, when part of their house collapsed during fighting between Iraqi troops and ISIS. 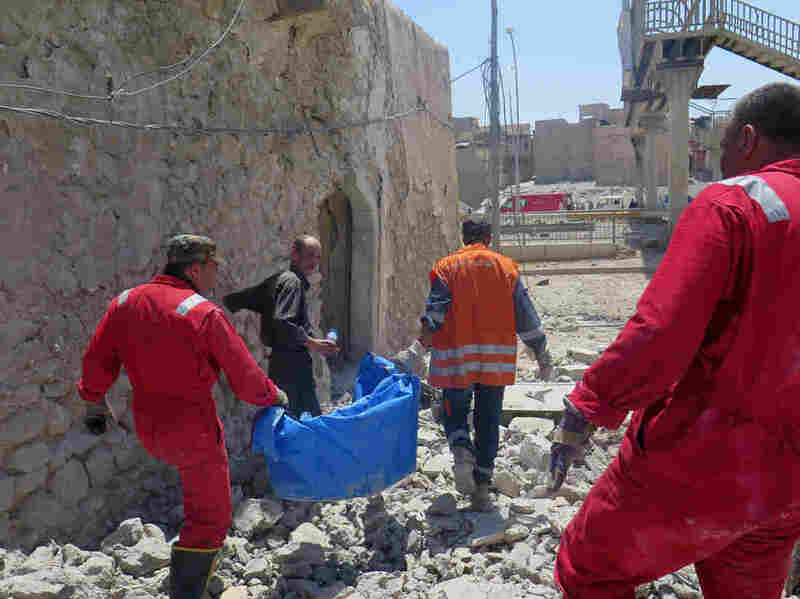 He returned to the city to retrieve his boy's body with the help of civil defense forces. Abdul Jabar, a father of five, lost his son Ahmed. He was 15. When their house collapsed around them during fighting in June between Iraqi troops and ISIS, Ahmed was trapped. The rest of the family members were able to extricate themselves. Abdul Jabar couldn't save Ahmed and had to leave him behind, while he was still alive under the rubble. 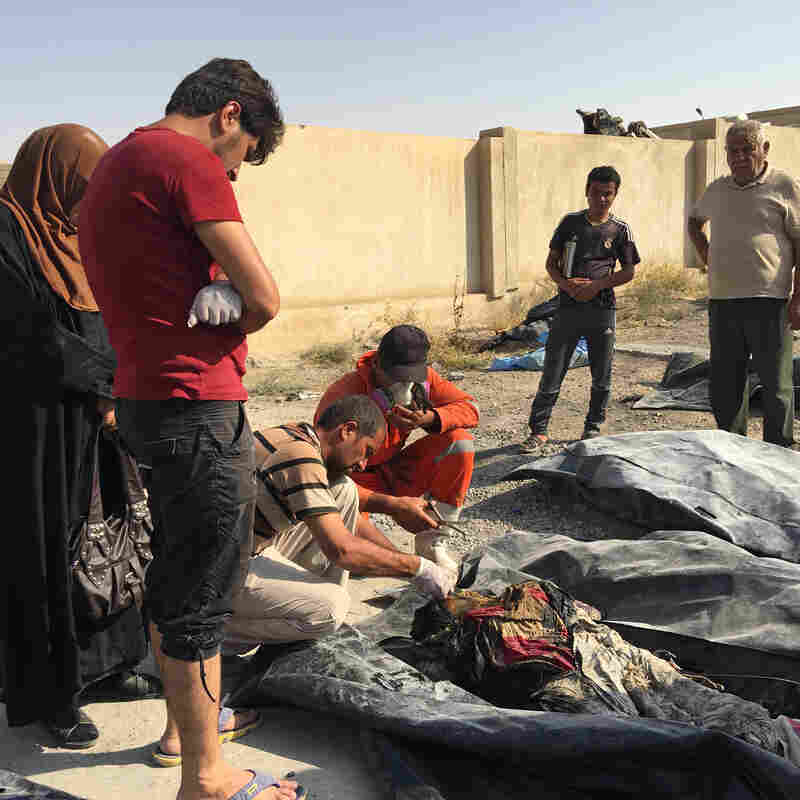 He and the other men gathered a few weeks ago at Mosul's civil defense forces base to try to recover the bodies of relatives killed during the battle for Mosul, which ended with the city's recapture from ISIS in July. Most of the victims in the oldest part of Mosul were crushed under the rubble of houses hit by mortars and airstrikes — trapped after ISIS wouldn't let them leave and Iraqi forces told them to stay indoors. Some of the dead were hastily buried in basements and gardens before surviving family members fled to safety. Before Abdul Jabar fled, he helped bury other people's children in his neighborhood. "The school there is full of dead bodies. There was a child who was a year old, another was 5 months old," says Abdul Jabar, deep wrinkles around his eyes and gray stubble on his chin. In the parking lot, a civil defense worker hands out body bags in a business-like manner to relatives who have volunteered to retrieve remains of their loved ones and bring them back to obtain death certificates. A group nods as he explains how to unzip the bags. People climb through destroyed streets in Mosul. Many were crushed under the rubble of collapsed houses hit by mortars and air strikes — trapped when ISIS wouldn't let them leave and Iraqi forces told them to stay indoors. Unimaginable tragedy befalls Iraqis with numbing regularity. The men in the parking lot tell agonizing stories as if they happen every day. In Iraq, they do. There is the special anguish of relatives who reached family members on the phone after they were trapped by rubble. By the time the neighborhoods were safe enough to enter, their loved ones were dead. And for people like Abdul Jabar, there is the torment of leaving wounded family members behind. Abdul Jabar sells vegetables from a cart. This is his third trip to the civil defense base to try to get them to retrieve his son's body. But the team is so overworked, they've not been able to respond. The civil defense workers have a backlog of more than 200 families asking for help. Abdul Jabar says he spent the night at the civil defense base because he couldn't bear to go back to his temporary home in Mosul and tell his wife that he failed again. He worries that dogs are eating Ahmed's body. It would take him hours of work to earn enough for taxi fare to get home — the only mode of transport here. It all becomes too much and he starts to cry. "I come and I go and I come and I go," he says. His voice rises and falls — a lament of weariness and sorrow. "You see all these people coming and going? The poor are the victims. We have no houses, no money, no comfort, nothing. Injustice has fallen on us. Injustice has fallen on the poor. "It's all because of the army," he says, sobbing. It's not just families that were destroyed in the battle for Mosul. Something else here died — the belief of many Mosul residents that their own security forces care about them. The military plan to retake Mosul, agreed to by Iraq and the United States, provided no escape for either ISIS or hundreds of thousands of civilians as security forces encircled the city. 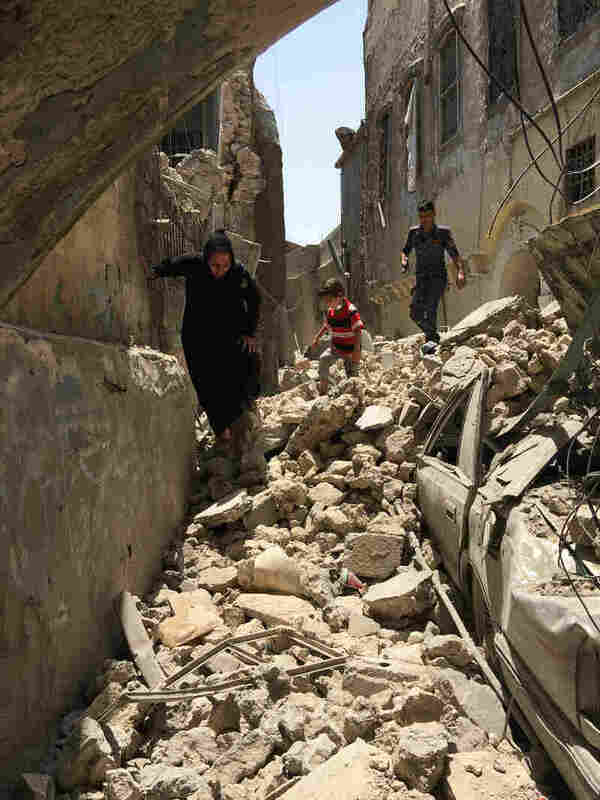 The U.S. stopped its airstrikes in March, when more than 100 civilians were killed in a Mosul building that collapsed after a U.S. attack. But the Iraqi military continued, and families were caught between ISIS artillery and snipers and Iraqi mortars and airstrikes. While those well-off enough had places to go or money to buy their way out of the besieged city, the poor had neither. During nine months of punishing battle, more than 1,000 Iraqi security forces are believed to have been killed. But twice as many civilians are thought to have lost their lives, and Abdul Jabar and others see their deaths as evidence that the Iraqi government was punishing the people of Mosul for not pushing out ISIS. "They are laughing at us," he says. "Every one of us." The other men in the parking lot chime in to complain about the provincial governor "sleeping in the air-conditioning" while they swelter in the heat, trying to bury their dead. The base commander — who, like the rest of his team, was not paid by the Iraqi government in the three years ISIS ruled Mosul — agrees to take Abdul Jabar to find Ahmed's body. We get into a red civil defense force truck, Abdul Jabar dwarfed by the muscular civil defense worker sitting next to him. As the truck rattles along broken roads, Abdul Jabar pulls out a battered leather wallet. It contains two banknotes worth about $10 and a postage stamp-size photo of Ahmed taken years ago. Bashar Abdul Jabar walks alongside civil defense workers as they carry his son's body. After an airstrike, their home's concrete blocks fell on 15-year-old Ahmed's legs, preventing him from escaping with the rest of the family. Abdul Jabar kisses the photo and puts it into his shirt pocket, next to his heart. "He was young," he says, crying softly. Entire city blocks of buildings are destroyed, almost as if an earthquake hit. We pass a neighborhood named after a famous sheikh known as a healer. Abdul Jabar remembers going to see him as a child. He tells the story of how his family fled their home. 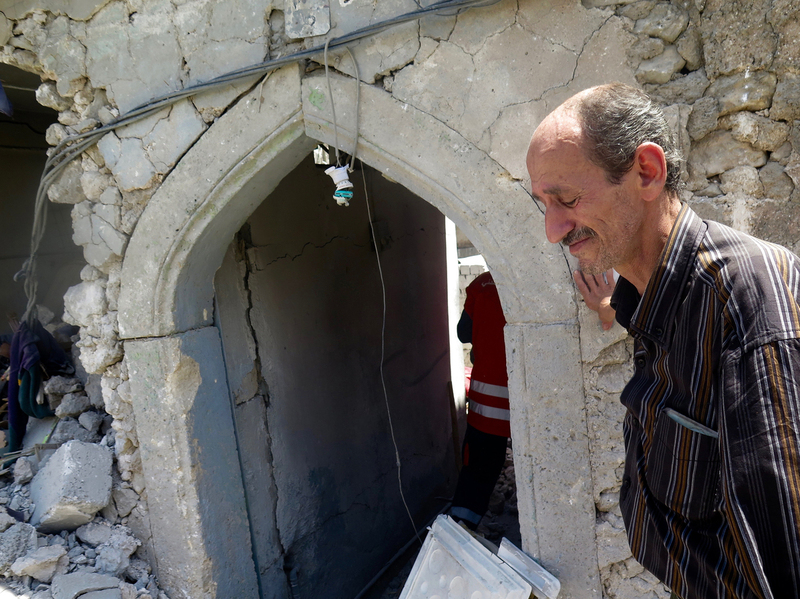 At the end of June, days after they ran out of food and Iraqi security forces approached, a house next door was destroyed by an airstrike. Two rooms of Abdul Jabar's own house collapsed, crushing Ahmed's legs. Abdul Jabar and the rest of the family emerged from the basement, fearful that soldiers would mistake them for ISIS members. "We were shouting and telling the army, 'For God's sake, don't shoot us!' "
He didn't have a white flag to wave and show the army they had peaceful intentions. So he took off his underwear and waved it in the air. Abdul Jabar says he begged soldiers to help rescue his son, but they refused, telling him it was too dangerous. They sealed the area and he says they wouldn't let him return. At his old house, the vaulted entrance is still standing, but the walls around it have crumbled. A civil defense worker shoos away a cat. Another goes to get a crowbar to lift the chunks of concrete. "He died alone here," Abdul Jabar says. "All alone." He sits down and sobs. "Pray for him. Depend on God," the civil defense workers tell him. It's what Iraqis say to try to persuade someone to stop crying. Tears are a luxury people here can't afford.